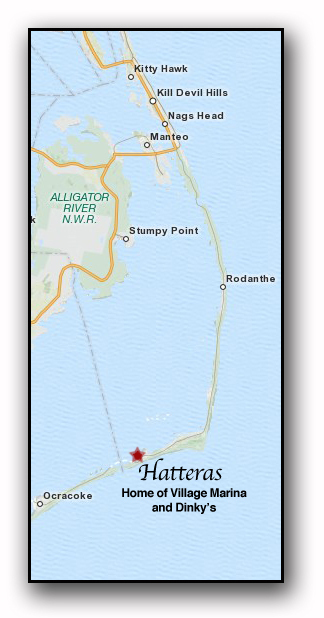 Below you will find directions from points north,south and west of Hatteras. If you don't see directions from your area listed above, we strongly recommend using Mapquest, an online service which does a great job of providing maps with driving directions from anywhere in the country. Just click the logo below. From points North/Northwest: Take interstate highways to Virginia Beach, Virginia. From I64 East take exit #290 (Rt. 168 South or Battlefield Blvd.). Follow Rt. 168 South into North Carolina approximately 10 miles where the road becomes US158 South. Follow US158 South through Nags Head, NC turning left onto NC Hwy. 12 South. Continue on NC Hwy 12 South over the Oregon Inlet Bridge and onto Hatteras Island for approximately 60 miles until reaching Hatteras Village. Village Marina will be on your right. From points South and West: Follow I95 North to the Rocky Mount NC exit #138 or US64 East. Continue on US64 East to Nags Head NC turning right onto NC Hwy 12 South. Follow NC Hwy 12 South over the Oregon Inlet Bridge and onto Hatteras Island for approximately 60 miles until reaching Hatteras Village. Village Marina will be on your right. Scenic Ferry Route from the South: Follow US17 North to Wilmington, NC then North approximately 20 miles to turn right on NC Rt172 through the Camp Lejeune Marine Base. Turn right onto NC Rt. 24 towards Morehead City, NC where you will turn right onto US70 East. Follow US70 East towards Cedar Island where the road will become NC Hwy 12 North. The Cedar Island ferry reservations must be made in advance by calling 1-800-856-0343. A pleasant ferry ride 2 hours and 15 minutes ends at Ocracoke Island where you will follow NC Hwy. 12 north for 15 miles for the departure by ferry to Hatteras Village. After another pleasant ride across Hatteras inlet you will continue north and reach Village Marina just 1 mile north of the ferry docks. Scenic Ferry Route from the West: Follow NC Rt. 264 to Swanquarter, NC for an enjoyable ferry ride from mainland Hyde county to Ocracoke Island. Follow NC Hwy North for 15 miles for the departure by ferry to Hatteras Village and Village Marina.